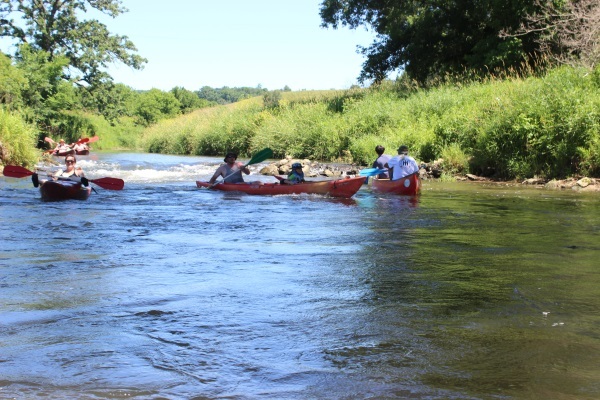 The 17th annual canoe trip, sponsored by the Health and Wellness team of the Ho-Chunk Health Department, gave the perfect opportunity for a little “ah” at the end of the week. The weather was beautiful – not too hot, not too cold – and just right for a float down the river. The trip was available to all Ho-Chunk employees and their families. The group participating in the trip, about 60 of them, began the adventure by gathering at the lower shelter at the Wildcat Mountain State Park near Ontario, Wisconsin. “The purpose of the canoe trip is to encourage members to stay active in different ways. This is a little easier to do as a family, other than the typical gym exercise equipment,” said Exercise Physiologist Chris Fredricks. The river is something that they may have never tried before, he said. Organizers have been holding the event on the Kickapoo River the last few years because it is a relatively shallow stream, therefore safe for small children. In the past, they have held the canoe trip at other sites, such as the Wolf River in eastern Wisconsin, and at a lake near Stevens Point. AS the people gathered in the shelter, Kathleen Clemons told about the outing and led the group in stretching exercises to prepare for some serious paddling. A shuttle bus arrived to gather the group and transport everyone upstream to the starting point, a spot on the river with a sandy shoreline to make launching canoes and kayaks a simple task. At the launch site, in the small village of Ontario, a multitude of canoes, paddles, and some kayaks rested on the grass. One of the outfitters in the settlement, Titanic Canoe Rental, provided the watercraft and equipment. With that name, some participants were concerned about repeating the fate of the Titanic, but their worries were dispelled when learning that the stream is no deeper than waist height. Ashley Rave, a Language Division instructor, said she joins the annual paddle fest because she enjoys the outdoors and getting exercise. At the launch site, Kathleen helped steady the canoe alongside the shore while paddlers climbed aboard and set off downstream. Almost immediately, each canoe load of people encountered what could be termed a “logjam” of other canoeists, all congregated in the relatively same space. All canoers were trying to gain some personal space, while others were just trying to regain control of their watercraft. As the downstream possession progressed, more open space was encountered, allowing the paddling-challenged people to stay behind to gain some sense of composure, while the more experienced canoeists forge ahead into open waters. Along the way, canoeists encountered beautiful scenery, including upward-stretching sheer rock cliffs, trees stretching over the water to provide an overhead canopy, and an occasional downed tree or paddle around. Swallow nests dotted the underside of a roadway bridge, visible to people as they passed beneath. In one place along the stream, a drop and a rocky narrowing caused the water to flow swiftly. A ride through the channel resulted in a quick slide downward, not at all different to ride at one of the waterparks in the Dells. The result was a lot of “Ooos” and screams that could be heard in either direction along the route. Members of her family use the event as an activity that her family can do, plus allow them to get together as a social outing once a year. “We used to canoe on this river (the Kickapoo) and the Black River. Now we just get together at this event,” she said. “There’s no tipping of the canoes allowed, just paddling and visiting. We might stop on one of the sandbars and have some snacks, or take a dip in the water,” Neile said. The canoe excursion ended when the participants managed to paddle downstream to the staging area – the lower shelter where everyone gathered before taking the shuttle bus. Chris was standing near the landing, guiding everyone into a stable exit from their rides. Upon beaching and back on foot on dry land, the canoes were deposited upside down on the grassy area and each person made the trek back to the shelter. There were a variety of foods were available to restore the energy lost while paddling down the river.